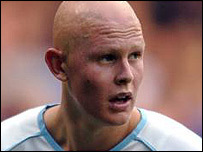 West Brom have completed the signing of Burnley midfielder Richard Chaplow on a three-and-a-half-year deal. Last week, the Baggies had a bid for the player rejected, but have succeeded with an improved offer of £1.5m. And Albion boss Bryan Robson believes Chaplow, 19, is very capable of making the step up to the Premiership. Robson said: "He has got a terrific work-rate and a bit of pace about him. He has got really good confidence and he can create and score a goal." But Chaplow, whose deal also has an option for a further year, has not signed in time to face Crystal Palace on Tuesday. Burnley boss Steve Cotterill said he would miss Chaplow but that the money was too good to turn down. "For a deal of £1.5m in cash with a sell-on clause, it is an excellent deal by the chairman," said Cotterill. "We've held our nerve right until the last minute and obviously we'll miss Richard around the place. "But we have done well without him when he was injured this year and we will look to continue to do well in his absence." Meanwhile, Robson said he had been keeping tabs on Chaplow for some time. "I saw him when he first came into the Burnley side," said Robson. "I had a game of golf one day with the then Burnley manager Stan Ternent and he was talking about Chaplow in really high terms. "The one thing he is maybe not great at is the defending side of the game but he can learn that. "I wouldn't be asking the chairman to pay the type of money we are paying Burnley unless I thought he could make that step up." Chaplow, an England U21 international, has only played three games since returning from a three-month lay-off with a knee injury.